It's time for AVC but we still have a new SIK and a few new boards to help you interact with your Teensy! The 2015 SparkFun AVC is tomorrow!!! Please join us for a fun filled day of autonomous robot races, combat 'bot battles, food trucks, maker workshops, electronics and tech demos, building tours and the grand opening of the SparkFun Emporium! We'll open to teams at 7 a.m.. Teams, please do not come before 7 a.m., you will not be admitted into the event space and will have to wait until 7 a.m. to be admitted. Spectators, ticket are still available for sale and they will be available for sale at the door as well. They are $6 even. Everyone, please do not bring aerial drones, quadcopters, fixed wing planes or heli's. Also, please leave the furry friends (dogs) and alcohol at home. We also want to remind everyone that it will be a very sunny day so bring lots of sunscreen, hats and sun umbrellas. If you are unable to make the event in person, we'll be live streaming the races tomorrow, starting at 10 a.m., right here on the home page. Also check out the AVC site for this year's rules and winners after the event. Now on to the product post! It's Friday and, once again, that means new products! We have had a pretty exciting time this week, from preparing for the seventh annual SparkFun Autonomous Vehicle Competition (lovingly called the AVC) and making sure these awesome new products are ready for you. Let's take a look at the video and see what we have! 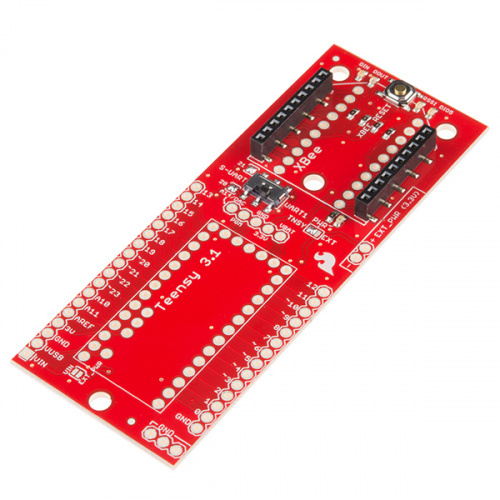 That's right, a new SparkFun Inventor's Kit for LabVIEW and some great adapter boards for your Teensy to make it more adaptable for almost any project you have in mind! 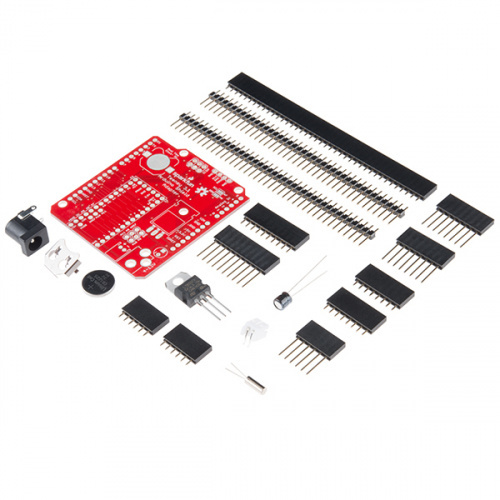 The SparkFun Inventor's Kit for LabVIEW is a great way to add real world connectivity, programming, and hardware incorporation to your LabVIEW projects. The SIK includes everything you need to complete 14 circuit experiments, created in conjunction with the LabVIEW MakerHub, that will teach you how to use the LabVIEW graphical programming environment, read sensors, drive motors, and more. Each SIK for LabVIEW also includes the LabVIEW Home Bundle, a specially licensed version of the LabVIEW system that utilizes drag-and-drop interaction for quickly building graphical user interfaces with extensive signal processing, analysis, and math functionality! Don't worry, you won't need any previous programming or electronics experience to use this kit. The Teensy is an amazing and compact development platform in a breadboard friendly form factor, but what if you could incorporate it into the Arduino architecture? The Teensy Arduino Shield Adapter allows you to attach your Teensy 3.1 (or Teensy LC) and utilize your favorite Arduino shields without the requirement of a breadboard or any complicated wiring. Needless to say, the Teensy Arduino Shield Adapter is a useful tool for upgrading all of your existing Arduino projects to a more powerful controller! The Teensy 3.1 XBee Adapter allows you to connect your Teensy with the tried and true XBee series to provide you with a great solution to any project that requires a decently ranged no-frills wireless serial link. Not only does the Teensy 3.1 XBee Adapter connect a XBee and Teensy together, it also acts as a breakout board for both. Each pin on the Teensy and XBee has been broken out to standard 0.1" spaced through hole soldering points that allow you to connect any additional parts that you would like to incorporate with the adapter. 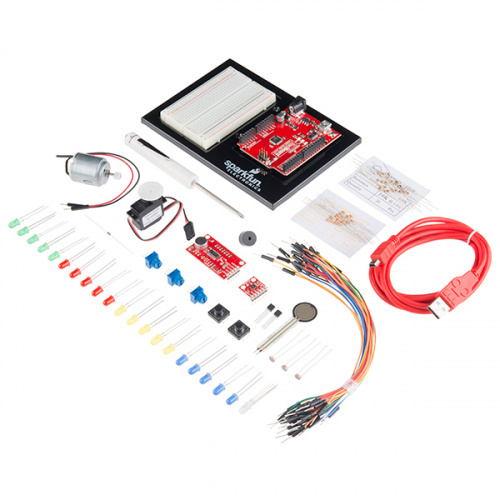 The SparkFun LED Starter Kit is an ultimate assortment of LEDs packed into a single red box! Now, this isn't a box filled with only one type of LED, oh no. 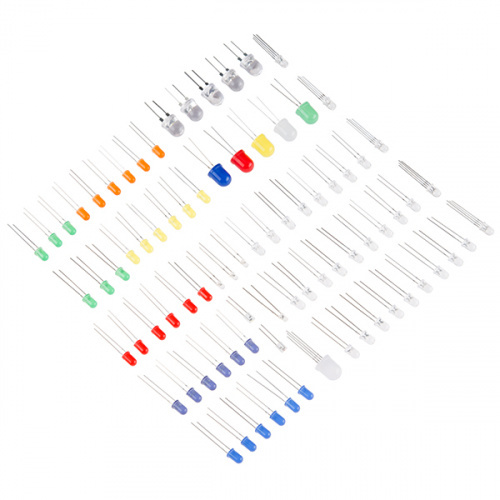 Inside each kit you will find over 70 multi-colored and multi-functional LEDs and even more resistors to help hook everything up. That's all we have for this week. Don't forget, tomorrow is AVC so if you are coming out we hope to see you there! If you can't make it out tomorrow, no worries, we'll catch you back here this time next Friday for even more new products. Did I forget how to count, or did Sarah say 12 buttons when there are 16 on the box? You are correct, I don't know why I said 12, it indeed has 16 triggers, and can be reprogrammed to accept even more inputs with a little extra work. For the lazy: Live Stream should be on at 12 PM EDT. The Teensy Arduino adapter is similar to something that I've been playing with in my spare time. Basically Arduino shield adapters for the various small arduino-compatible boards. I was starting with the various '328 based boards and providing options to either install inefficient (but cheap) linear regulators or Pololu buck/boost modules. I just keep getting stuck in over engineering morasses and combating feature creep. I'm keeping at it (not really expecting to make any products), mostly to have something to keep practicing at (and playing with new features on daily builds of) KiCAD. It is. And don't worry, I remembered to go to the bank. How about the fact that Robert's T-shirt is the same as the one last week? Something's not fresh here! Friday Product Post: PaPiRus & GoPiGo!